6.00 points at 13 votes (rank 632). 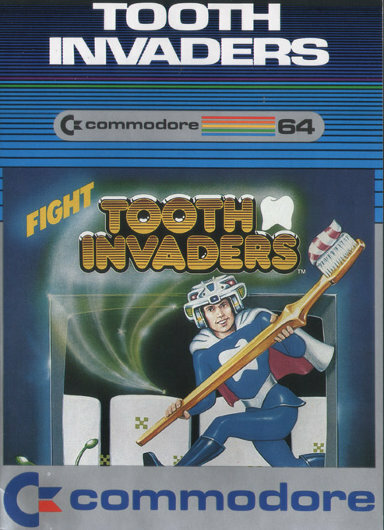 In Tooth Invaders the player takes over the role of Plaqueman, the hero of clean teeth. Plaqueman takes over the fight against D.K. Germ Plaque, which constantly tries to stain wonderfully white teeth until they decay and finally fall out. Plaqueman is armed with dental floss and the combination of toothbrush and tooth paste which he needs to take care of eight safe teeth and defend them against the doings D.K. Germ Plaque. Due to the topic one can assume that the game was thought to familiarize children with dental hygiene. You can see at the graphics that this is a very early game. Sprites in the basic colours are everything this game needs. The graphics are a bit bold but they serve their purpose. In the zoomed view the screen scrolls softly into four directions. The entrance of D.K. Plaque, the grand appearance of the hero and its death are accompanied by a short melody. Furthermore, a tune of success is played when a tooth has been cleaned. Apart from that there are only sound effects which are very adequate. E.g. there are bursting noises when Plaqueman swings the brush, the staining by D.K. can also be heard and a warning sound rings several times, when a tooth starts to decay. 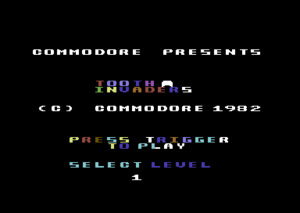 In the title screen you can adjust the starting level 1 – 9 by joystick left or right. The game is started with a press on the fire button. In this view you get the overview of all equipment and the state of the teeth. In the middle are eight teeth, to the right of this the tools. The blue Plaquemen represent the number of lives, next to them the current highscore. Above the lives is the current score and next to them the number of teeth and their state. In the same line is the level number. The overview is used to switch between floss and tooth brush (and vice versa), cross long distances and detect a decaying tooth. Plaqueman has the ability to shrink himself and his tools that he carries to make an exact job. In the zoom view you can start your work. Here you see in the lower part the same information as in the overview. In the middle the zoom went closer to the teeth so you can see the filth and the D.K. properly. It is important from this view to keep the tooth display in sight, as here you can see if a tooth starts to decay. In the overview you first grab a tool. Plaqueman is simply steered with the joystick into the corresponding direction. When you have the tool in your hands you go to the corresponding location at which you want to clean and press the fire button . Now you start to clean the teeth with the tool. Same as in real life you use the floss for the interdental spaces and with the brush you care for the surface of the teeth. Here you have to pay attention to every grain of dirt. Of course, the tooth brush only works, if it has been covered with toothpaste. Therefore take the brush out of its holder and walk with it over the toothpaste. When you have cleaned a tooth completely, a melody sounds and the tooth is clean. If you zoom out again you will see that this tooth now flashes in different colours. This tooth is now safe and cannot be soiled by D.K any more. In the zoom view Plaqueman has to beware of the Germ. If he does not take care and gets touched by the Germ, it will end deadly for Plaqueman. If you lose a life, the dead Plaqueman is carried into the sky by a balloon. But Plaqueman can take revenge. After having cleaned a tooth he can kill the Germ in the next 10 seconds, which reappears after a short time. If you neglect a tooth, it will reach a degree of pollution at which it starts to decay. Then a warning tone will ring and the tooth display gets green. You should zoom out then to see which tooth is affected and instantly go and reduce the pollution. If you do not do this, the tooth will go on decaying and finally fall out. 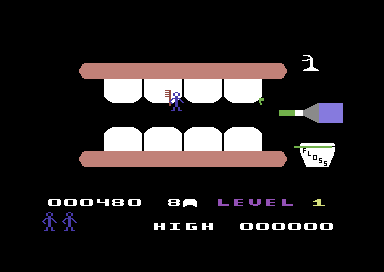 As soon as you have cleaned the last tooth, the game automatically zooms out and shows all teeth that are still left and flashing in different colours. Then they get a shower of flour rinse for a sustainable care of the teeth. But the Germ is not far behind and will return for the start of the next level. D.K. Germ gets faster, more aggressive and more intelligent. It moves faster and after killing it, it reappears faster. In the higher levels it knows where you are and follows you persistently. . The initial pollution of the teeth rises. In level 8 or 9 it can happen that without the doings of the Germ one of the teeth starts to decay instantly. The decaying process gets faster. Partially you are without a chance there. The game can be paused with the C= -key. By moving the joystick or pressing the fire button the game is continued. A press on RESTORE aborts the game and takes the player back to the title screen. There are additional lives at: 10.000, 20.000, 35.000, 50.000, 75.000 and 100.000 points. The game is over when 4 teeth have fallen out or all Plaquemen have been lost. As long as you are in the overview, the Germ cannot harm you, you only get vulnerable if you shrink yourself and stand face to face with the Germ. To cross greater distances you should rather zoom out and then zoom in again. Unfortunately, the Germ can get you from a currently not visible corner, there it is advisable not to walk much along the borders of the visible area and zoom in and out often to keep an eye on the Germ. The single pixels that you have already cleaned cannot be polluted any more by the Germ. First clean all interdental spaces. It does not happen often that new dirt is placed here in the lower levels. Then you can clean the teeth with tooth brush and toothpaste. This way you do not have to change the tool and after cleaning the last dirt grain you have a clean tooth that cannot get polluted anew. The game has probably no ending. 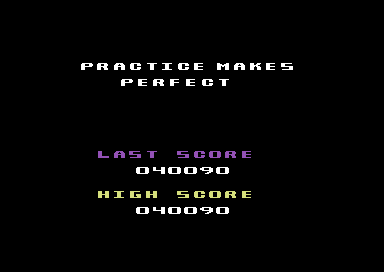 In the level settings of the title screen only one-digit numbers are allowed. 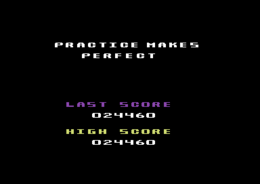 If you should make it to proceed one more level despite the horrendous speed of decay in level 9, there is no number in the level display but a tooth and more and more levels will be generated.